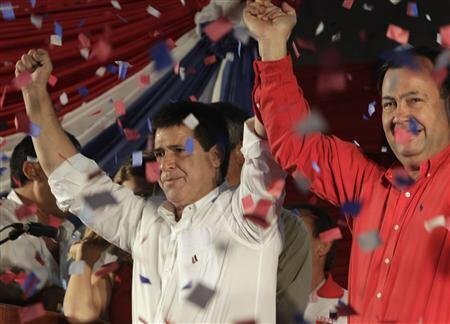 Horacio Cartes, a tobacco tycoon and a political novice, had a resounding victory in Paraguayan presidential elections, bringing back to power the Colorado Party, which ruled the country with a tight grip on power for over sixty years until 2008. Cartes, who is widely accused of narco-trafficking, smuggling and money laundering, all of which he denied, won the elections with 45.8% of the votes, while second runner-up, Efrain Alegre, got 36.94%. Almost 69% of the more than 3.5 million Paraguayans eligible to vote went to the polls to cast their ballots and choose not only president and vice president, but also members of congress, governors and representatives to the Mercosur parliament. The Colorado party (ANR) also obtained 19 seats in the senate, 4 more than in the past elections while the liberals (PLRA) got 12, losing two seats from its actual 14. The left managed to increase its number of seats with Frente Guasu gaining 5 seats, the Partido Democratico Progresista gaining 3 seats and Avanza Pais 2. UNACE, the party that allied with the PLRA for these elections got two seats, marking a sharp decline from the 9 seats it has at the moment. The senate is completed with one member from the Partido Encuentro Nacional and another one from Patria Querida, who lost 3 seats. In the lower house the ANR went from six seats now to eight, the PLRA maintained the same number of seven seats, UNACE went from four seats to one and Avanza Pais gained one seat. What the numbers are telling us and what does all that mean? Paraguayans voted in the same lines of 2008, to a complete stranger to politics hoping he would be able to bring change from within. Cartes is a political novice. He only came to politics a few years ago and bought his way into the Colorado Party. This was not only his first election as a candidate but also as a voter, it was the first time the new president of Paraguay actually voted in a national election. But Paraguayans also seem to indicate that they did learn something from the 2008 elections, you can’t bring a complete stranger with no political platform and that’s probably why they went for Cartes, a political newcomer running for the strongest political party of the country. The results of the elections represent a huge blow to the liberal party. The message was loud and clear “we don’t agree with how the party managed the political trial to Lugo and we don’t agree with your alliance with the UNACE.” The PLRA not only lost the presidential bid but also lost seats in the senate and lower house along with governors in places which were usually their strong hold. In a similar fashion the popular vote also punished severely Patria Querida, in this case not because of their alliances but because of their involvement in the political trial to Lugo, which coupled with a few other significant political mistakes in the past few months seems to indicate the death of the party. This one is a lesson everyone from the opposition already knew but somehow they thought they could get around it, well not really. 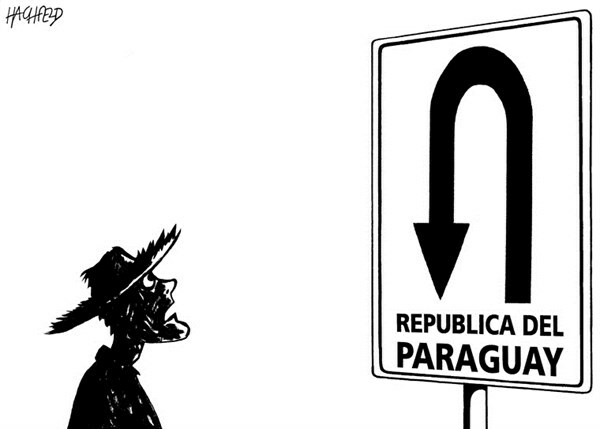 In Paraguayan politics unless you make alliances you won’t win against the Colorado Party – a party simply too smart, too old and entrenched in Paraguay politics and which keeps winning because they know how to navigate the system – we have seen this again and again as a very consistent and strong trend. What we still need to figure out is how to build strong alliances within the opposition in order to efficiently put up a fight against the Colorados. With such a large portion of the population under 35 years old, 62% of the population is under 30, there is always a wishful thinking in Paraguayan politics that the youth vote will change the political course of the country. This proved to be a myth once again. Youth in Paraguay are profoundly disenchanted with the entire political process and feel their vote makes no difference which helps explain low participation rates. On the other hand, the ‘hard vote’ – the vote based on parties rather than candidates – keeps being the dominating force in politics. There is also a very strong message in this election which is the power of the status quo and the client state. The overwhelming consolidation of power of the Colorado Party in this election strongly indicates how conservative Paraguayan society still is. Cartes will need to provide strong and clear explanations to the accusations of his involvement in narco-trafficking, smuggling and money laundering. These issues will most likely turn international attention to issues of political stability and rampant corruption in the country and he will need to be prepared to provide some convincing answers, or at least try. With the economy expected to grow at 13% this year, the problem in Paraguay is one of increased inequality, poverty, lack of access to basic services and disparities in landholdings. Paraguay is one of the most unequal countries in the region, a scandal even to Latin American standards, with more than 80% of the land being controlled by two per cent of the population. With close to 50% of the population under poverty, the new government will need to find a way to provide answers to increasing social needs and show that the economic boom the country is undergoing thanks to commodity prices is not one that will only benefit the oligarchs and traditional elites but the population at large. Unless these issues are address from the root, expect to see increasing social unrest in the country in the coming years. Cartes’ election puts the regional hegemons, Brazil and the United States in a very complicated situation and raises questions about the situation of Paraguay in the Mercosur. Cartes will need to find a way to re-establish positive relations with the region and find a way to bring Paraguay out of the international isolation it has been suffering since June last year, a crucial and urgent matter for a landlocked country like ours. As Paraguayans wake up to a new president, for those of us focusing on politics, Cartes election is worrisome, to say the least. With Cartes we can expect high levels of land and social inequality and a low-quality democracy in the next five years, certainly not a positive forecast for a nation in dire need of structural change.